TWIN TERRORIST THREATS inched closer to Iloilo City, a short 12-15 minute pump boat ride from Guimaras, the island province we call home. 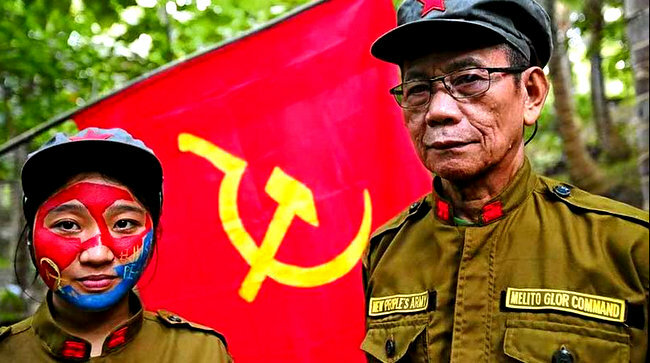 40-50 armed rebels from the New People’s Army, NPA, a Communist insurgency group, raided the Maasin, Iloilo police station this past Sunday. On the same day a sister of the Maute brothers, a terrorist group, and two others were arrested near the Iloilo port. Iloilo City Mayor Jed Patrick Mabilog has placed Iloilo City on full Red Alert status. Maasin, Iloilo is only about a 30-minute drive, 27 kilometers, from Iloilo City according to DistancesFrom.com. NPA rebels struck Maasin in broad daylight on a busy Sunday market day at around 10:30 a.m. According to The Panay News, the Communists had overtaken the Maasin police station and handcuffed nine police officers but did not harm them. No shots were fired during the incursion. The NPA police station raid, which took less than 15 minutes, netted the rebels eight M16 rifles, four Glock .9mm pistols, five handheld radios and their base, two laptops, P29,000 cash, and jewelry. The rebels did not harm the nine police officers but handcuffed them. They also used the police station’s patrol car to flee. Three rebels, including two women, first entered the station around 10:30 a.m. and pretended to be residents who were filing a police blotter report. Suddenly, more rebels barged into the police station through the back door and handcuffed the nine police officers on duty. Other NPA members, who came on board an Elf truck, surrounded the police station beside the public market. Early this month, the Iloilo Police Provincial Office warned police stations in Maasin, San Joaquin, Guimbal, Miag-ao, Tubungan, Igbaras, Alimodian, Leon, Calinog, Bingawan, Badiangan, San Enrique, Passi City, San Rafael, and Lemery that they were targets of NPA raids. Officials were even warned of the fake police blotter diversion. Iloilo City Mayor Jed Patrick Mabilog placed the metro on full Red Alert status at around 2 p.m. of June 18, 2017, three hours after the NPA raided the police station of Maasin in Iloilo province. The mayor called on the public to remain calm but vigilant. A sister of the Maute brothers and two others were also arrested near the Iloilo port on Sunday, according to a report posted on GMA News Online. Last week, the Iloilo City Police Office (ICPO) alerted coastal barangays in the metro on the possible entry of terrorists who will escape Marawi and spread terror in the city. Senior Supt. Zacarias Remus Canieso, ICPO director, said it is better to assume Iloilo City is a target. Capt. Leopoldo Panopio, commander of the Philippine Coast Guard (PCG) in Northern Mindanao, said the Maute sister was arrested while on board 2GO’s MV St. Therese of the Child Jesus near the port of Iloilo. This was the same vessel my asawa and I had taken on a trip from Manila to Iloilo City last year. Coast guard personnel spotted the Maute sister, whose name the official has declined to disclose, at the port of Cagayan de Oro City on Saturday night. After confirming the Maute sister’s identity on Saturday morning, law enforcement officials rushed to Iloilo province to intercept the 2GO vessel. It was not known if the Maute sister’s destination was indeed Iloilo City or Manila. The Maute sister was arrested at past 3 p.m. She used fake identities at the Cagayan de Oro City port. Two companions of the Maute sister were also arrested. The ISIS-inspired Maute group have held Marawi City in Mindanao under siege for almost a month now.